It may seem to some of our readers and friends that we’re just rolling along on an extended vacation just hopping along from city to city living a life of leisure. But, we actually have a ridiculously hectic schedule, getting up at 7 am nearly every day, then filling ten to twelve hours with hundreds of miles, innumerable museums, tourist traps and people. Sometimes leaving before dawn and arriving home after dusk. So, sometimes we need a vacation from this vacation. The Outer Banks are a 200-mile-long stretch of beautiful sandy islands that cover nearly half of North Carolina’s northern coastline. The islands are known for their temperate weather whose beautiful beachfront property has been developed with attractive, colorful homes. We stayed at the cheapest hotel we could find, but were delighted to find out that, not only did we have direct beach access, but, with temperatures in the mid- to high-70s, we were in for “beach weather” all three days. So of course, we immediately took a long, peaceful walk along the beach outside the inn. We took off our shoes, waded into the cool water and searched for shells and sea glass. Then we drove over and spent a few hours at the Wright Brothers Memorial (click here) – a beautiful memorial to what might be one of the most important days in the history of our planet, the first ever powered flight. After a great night’s sleep on a wonderfully comfortable mattress, we decided to drive down the coast. Our first stop was Jockey’s Ridge State Park. Jockey’s Ridge, located in Nags Head, is the tallest natural sand dune system in the Eastern United States, and probably the most significant landmark on the Outer Banks. The walk around the dune was very soothing, but also isolating. In the offseason, it was like walking alone in a desert. Apparently, the park hosts as many of 5,000 visitors each day. The Outer Banks are well-known for their wind, and the dunes are no different. The wind is what gives these dunes their ever-changing shape, and also provides power for kite flying and hang gliding. In fact, for only $99 per person, visitors can schedule hang gliding lessons which include five flights. It was too expensive this time around, but it’s made our bucket list. 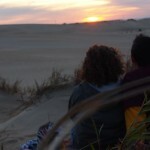 Later that night, we came back, found a secluded dune and watched a slightly less than stellar sunset, obscured by the coast and the dark clouds threatening rain – which makes me wonder, can there really be a “disappointing” sunset. As I said, the winds on the Outer Banks are perfect for kite flying, so we stopped by Kitty Hawk Kites and bought a cheap “starter” kite and headed to the beach for a bit of flying. Pictures say a thousand words, so check ‘em out. There’s so much to see in the Outer Banks – beautiful lighthouses, stunning beaches, kitschy shops and wonderful beach-view restaurants. Since we were visiting in the off season, many places were closed and others further down the coast were still fighting back from Hurricane Irene. But honestly, we felt lucky to have great weather and a chance to escape the crowds for a couple days. On one of the many beaches. Yeah… I’m flying a kite. Victoria about to brave the dunes.